Ben Toomer, having put back his flight to New York to start a new job in order to compete for the Club, got the team off to a good start, posting the fastest HW time of 17:30 over the opening 6km leg. He handed over in 9th to Andrew Penney (17:46) who gained three places on the second stage, while Howell Craske (18:06) held onto sixth place with the ninth fastest time of his leg. Tom Jervis (18:22) handed over in ninth on leg four and Jonny Cornish (18:28) held onto that position in the penultimate stage, while Belal Ahmed, only three weeks on from running a p.b. of 2:23:11 in the Berlin Marathon, brought the team home in 19:12 to finish as the fourth finishers from the South of England and the top Surrey and South London club. The B team also had their best ever finish in 45th. Will Russell was 51st in 18:49 on the opening leg. Neil Fraser clocked 19:51 on leg two, handing over in 57th to Finn Johnson who was the fastest of the squad, gaining six places in 18:31. Joe Clark (19:42) held 51st place on the fourth leg with David Lewin (19:34) gaining three places on the penultimate lap and Fred Slemeck (19:10) making up a further three places on the anchor leg. Pictures of legs 1-4 below courtesy of photographer Stephen Lee (l to r: Ben Toomer, Andrew Penney, Howell Craske and Tom Jervis). 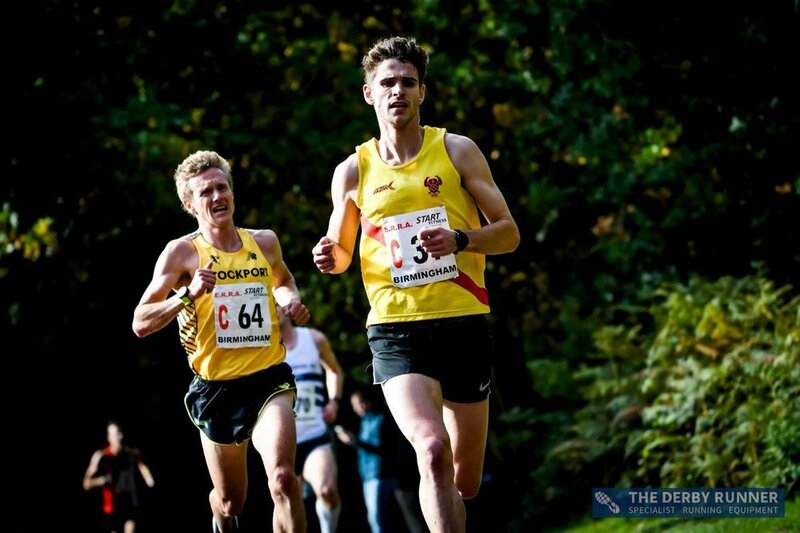 Having run the fifth leg for the Men's A team in the National Road Relays, Jonny Cornish completed a busy weekend when he finished seventh in the Oxford half-marathon in 1:11:08 on Sunday, writes Tom Pollak. Two Hercules Wimbledon youngsters were in action for Surrey in the South of England Inter-Counties meeting at Horspath, Oxford. In her final race of a season truncated by injury, Zipporah Golding finished fourth in the U15 Girls 100m in 12.76 to help Surrey to joint seventh place out of 15 teams. Making his Surrey debut teenager Morgan Sullivan, in only his first season with the Club, leapt a personal best of 12.72 metres in the triple jump, finishing fifth. He was also close to his best in the long jump, finishing seventh with 5.83 metres. Hercules Wimbledon’s Tom Cheetham was top V50 finisher in the Folkestone Rotary half-marathon in 1:30:40 and 28th overall in the field of 480 runners. On Saturday 29 September two of the Club's athletes notched up victories in the East Surrey League meeting at Lloyd Park, Croydon. Teenager Henry Silverstein made a great start to his autumn racing programme winning his first senior cross country race by 38 seconds in 28:40, despite being one of the youngest runners in the field at just 17. U15 Morgan Rennie also posted his first cross country race victory, taking the young athletes two miles event in a tight finish (winning by just one second) in 10:46. Edward Newton (11:57) was seventh U15 finisher; Hector Revill was seventh U17 in 11:29, finishing 13th of the 84 competitors. while Thomas Beare (12:14) and Hans Hinde (12:16) were fourth and sixth U13 runners. Other HW runners among the 88 finishers were Rob Tuer (10th in 30:45) and Simon Woodley (29th in 32:54) while Lisa Thomas was sixth in the women’s race in 35:16. Richard McDowell keeps racking up the long distance achievements. On Sunday he posted a lifetime best in the Bournemouth Marathon, finishing second in 2:26:49, to improve by more than a minute on his previous best of 2:27:56 set in the London Marathon in April. 'Bournemouth was my second targeted marathon of the year and I was aiming to go quicker than London', says Richard. 'With a consistent summer of training (2000km in the 18 weeks preceding the race) I was pretty confident I could do so. It is not a particularly fast course, and although mainly flat along the coast, it is punctuated with a few short and sharp climbs. I foolishly set off into the lead rather quickly, covering the first slightly downhill 5km in under 16 minutes, and came through halfway in 1:10, a fair bit ahead of schedule. The second place runner wasn't too far behind. I could see him on the several out-and-back sections, such as the piers, hovering around 90 seconds'. At the turn-around point near Sandbanks, he recalls, 'my lead was down to 20 seconds as I was starting to pay for the enthusiastic early pace, and I was caught with 5km to go. Unfortunately I was unable to stick with the pace of the new leader, and he drifted ahead to finish around a minute infront. Despite suffering badly in the closing miles, and my pace dropping considerably, I did set a pb of 2:26:49, over a minute quicker than London, so it wasn't a complete disaster, but I was a little frustrated with myself for not running consistently as I have always done in the past, and I'm sure my 2:25 goal and the win would have been within reach had I done so. As it turned out Richard discovered that ' the winner took a different route to everyone else, apparently having been mis-directed at one point. He wasn't disqualified, although there were various officials stating that he ought to have been. Despite running a similar distance to me, during his detour he gained a good chunk of time, so had we both run the same course the outcome may have been different'. The previous weekend Richard had a runaway victory the Veteran Athletic Club’s 10,000m Track Championship at the Millennium Arena, Battersea Park. Not only was it his first ever track race over the distance, but his reward was the aptly named McDowell Cup, which has been presented to the winner since it was first contested in 1982. Hercules Wimbledon provided the top two women finishers in the Wimbledon Common 5km parkrun. Gina Galbraith took the honours in 19:00, finishing 23 seconds ahead of Alex Binley. Adam Harwood once again headed home the HW men's contingent finishing third of the 503 runners in 17:31, just 15 seconds outside his best time set in June. Richard Evans was second of the 18 HW finishers taking seventh place in 18:19. Jonny Earl was third out of 313 runners in the Kingston event in a personal best of 16:25, a six second improvement on his previous best set in September last year. Rob Tuer warmed up for the East Surrey League race later in the day by finishing sixth out of 359 runners in Dulwich Park in 17:04. Teenager Elena Dauster posted a personal best time for the second successive week in finishing sixth in the women’s section at Fulham Palace in 19:33, slicing eight seconds off her previous best. Gina Galbraith was the top woman finisher in the Wimbledon Common parkrun for the second successive weekend. She crossed the line in 19:04, six seconds outside her best time for the course set towards the end of August. She was one of 21 Club runners in action and overall finished 12th out of the 487 runners. Top HW finisher was Adam Harwood (second in 17:35) with teenager Hector Revill third in a personal best of 17:50, a big 22 second improvement on his previous best set at the beginning of June. Jonny Earl headed home a 303-strong field to win the Kingston event in a personal best of 16:02 to also post the top age-graded performance. Sun, 30 September: St. Mary's Richmond AC Masters & Open Meeting, Twickenham. 100m, race 2: 3.Kyra Stone (U13G) 14.29 (pb); 200m race 2: 5. Kyra Stone (U13G) 29.23 (pb); 1500m race 2: 2. Matt de Freitas (M50) 4:21.84 (sb).